1947….and the baby boom continues…..
And so the U.S. continues to develop its international personality while other countries around the world continue their march towards freedom. January 3 – 1st opening session of Congress televised. William Dawson becomes 1st Black to head a congressional committee. January 8: General George Marshall becomes first Secretary of State. January 10: British stop ships Independence and In-Gathering from landing in Israel. January 24th NFL adds 5th official and allows sudden death in playoffs. February 7th: Arabs and Jews reject British proposal to split Palestine. February 21: First broadcast of TV soap opera. February 21: First instant developing camera demonstrated in NYC. February 23: General Eisenhower opens drive to rais $170 million in aid for European Jews. February 28: Taiwan civil disorder is put down the the loss of 30,000 civilian lives. March 1st: International Monetary Fund begins operation. March 4th: WWJ TV, channel 4 (NBC) begins broadcasting in Detroit. March 12th: President Harry Truman introduces Truman-doctrine to fight communism. March 15th: John Lee appointed 1st Black commissioned officer in the U.S. Navy. March 20th: 180 metric ton blue whale (record) caught in South Atlantic. March 21st: President Harry Truman signs Executive Order 9835 requiring all Federal employees to have allegiance to the United States. March 24th: John D. Rockefeller Jr. donates NYC East River site to the UN. April 1st: First Jewish immigrants to Israel disembark at Port of Eliat. April 8th Largest recorded sunspots observed (7,000). April 16th: Lens to provide zoom effect demonstrated (NYC). May 3rd: Japan forms a constitutional democracy. New Post-war Japanese constitution goes into effect. May 7th: Paraguayian government unleashes contra revolt. May 13th: Senate approves the Taft-Hartley Act limiting the power of unions. June 19th: 1st plane (F-80) exceeds 600 m.p.h. Jackie Robinson hits his first of 19 home runs. June 25th: Tennis shoe introduced. 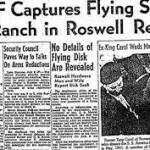 July 7-8: Reports that a UFO has crash landed in Roswell New Mexico are broadcast and disputed. July 9th: Princess Elizabeth and Lt. Philip Mountbatten are engaged. July 19th: Prime Minister of shadow Burma Government, six cabinet members, and two non-cabinet members assassinated by the British, causing political chaos that continues to this day. Sept. 29: Record World Series crowd of 73,365 at Yankee Stadium. Oct. 1: US control of Haitian customs & governmental revenue ends. Oct. 3: 1st telescope lens 200” in diameter completed. Oct. 9: First telephone conversation between a moving car and an airplane. Oct. 14th: Chuck Yeager makes 1st supersonic flight. Nov. 17th: The U.S. Screen Actors Guild implements an anti-Communist loyalty oath. Nov. 24th: Un-American Activities Committee finds “Hollywood 10″ in contempt because of their refusal to reveal whether they were communists. Nov. 29th: UN General Assembly partitions Palestine between Arabs and Jews. Dec. 25th: The Constitution of the Republic of China goes into effect. Dec. 26th: Heavy snow blankets Northeast, burying NYC under 25.8” of snow in 16 hours and LA sets a record high of 84 degrees. Dec. 30th: King Michael of Romania, forced by Communists to abdicate his throne. Romanian Republic declared.